He was not here throughout my life He did not teach me how to ride a bike, to swim nor to fish. Hm could it be because he too busy living his own life blissfully? 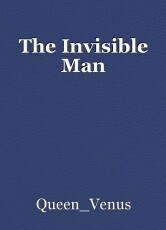 The invisible man is my father, because he was never really around. Month to month visitation, sometimes yearly because he couldn't stay rooted firmly in the ground. He did not teach me how to fly a kit or help with any projects. No father;daughter luncheon or dances for me. The invisible man is my father he did not teach me how to drive, he did not show me how boys gave lust wrapped in love's disguise. He didn't see me for prom nor on my first date, you weren't there waiting up when I came in an hour late. My dad is a magician. Nope, not a daddy I could see, he only appeared briefly throughout my life before disappearing once again on me. I use to wish for you to stay but that thought has sailed far off into the night. I'am not your little girl, daddy I'am twenty and grown. You missed so much you know, but hey that's your lost. My daddy is not my father atleast to me he'll never be, there's a difference in those words you know, Watching us grow is a luxury you'll see and being a real father is a gift; a true blessing you gave up the chance to be. Truth is I'll always love you but you'll never be half the man my sister, your sister,my mother,brother,cousin and grandpa had to be. Hey invisible man, I wish I could see you as the father that they were to me or just see you. © Copyright 2019 Queen of Queenz. All rights reserved.